Earth has 7 major tectonic plate boundaries and 10 or so minor ones. But it also has small micro plates less visible on a world map. 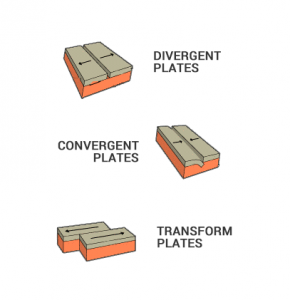 First, divergent plates pull apart from each other. Second, convergent plates push boundaries together. And conservative (transform) plate boundaries slide across from each other. Now, let’s take a look at each type of tectonic plate boundary in a bit more detail. Like seams of a baseball, tectonic plate boundaries wrap around the Earth. 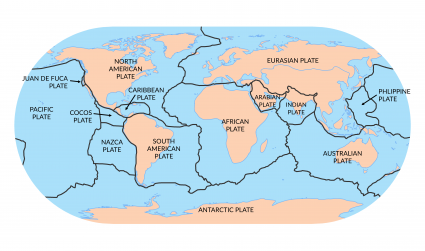 Earth’s tectonic plate boundaries are unusual because they can consist of continents and oceans. For example, the North American major plate not only contains the continent of North America but also the Atlantic Ocean. This plate extends all the way over the North pole and even contains Siberia and the northern island of Japan. Plates are always moving. Even though their movements are very slow, we can track them with extremely precise GPS measurements. In fact, they move about 5-10 cm every year. About 200 million years ago, Earth was assembled as one giant supercontinent “Pangaea”. Over time, it tore apart into the world we know today. But which direction do plates move? Plate boundaries can be divergent, convergent and transform. Beneath the oceans, lava erupts every day. But because it’s all are underground, we don’t realize it’s even happening. Actually, the Earth has 70,000 km of continuous volcanoes under the ocean. More specifically, the volcanoes are at mid-oceanic ridges. If you took all the water away from the oceans, it would be the most prominent feature on Earth. Plate tectonics begin at mid-oceanic ridges where plates are moving apart. Because plates pull apart from each other at divergent plates, lava spews out to create the youngest geological rocks on Earth. The African major plate is in the process of rifting apart into two separate plates where it will become ocean. In addition, the Somalian and Nubian plates will one day tear apart and become new ocean. 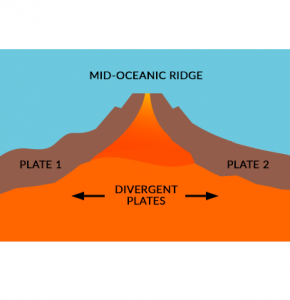 At divergent plate boundaries, they pull apart from each other at mid-oceanic ridges, which creates some of the youngest geological rock and even new oceans. But what happens at the opposite end of the plate? Convergent boundaries or subduction zones are where two plates collide into each other. Because matter cannot be destroyed, it forces one of the plates into the mantle underneath. At convergent plate boundaries, they have some of the most violent catastrophes and geology on Earth. When plates smash together, it has created chains of volcanoes. For example, almost all along the Pacific Ring of Fire, plates collide and sink into the ocean floor at zones of subduction. But continents don’t always collide with oceans. Sometimes, continents collide with other continents, which creates mountains. You can look all around the world and find examples. For example, the Nazca plate has created the Andes mountain range. It’s just that erosion wears it away fairly quickly. For example, the Appalachians use to be 5 miles higher, when Africa collided with North America. But over 300 million years, weathering and erosion have torn them down and washed them through streams. Lastly, conservative (transform) plate boundaries don’t collide into each other nor pull apart. Instead transform plates slid across from each other. We find most transform plates in the ocean basin connecting at mid-ocean ridges. For example, the San Andreas fault is between the North American plate and Pacific plate boundary. While the North American plate in the east moves in the southwest direction, the Pacific plate in the west moves northwest. 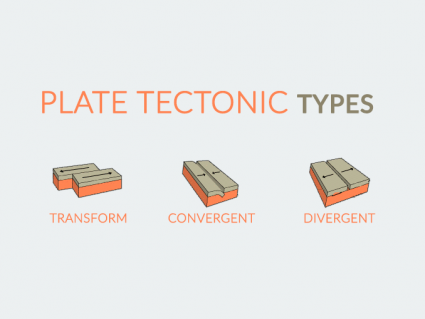 At transform plate boundaries, they’re neither convergent or divergent. For example, the Scotia Plate is surrounded by two major plates. But its neighboring plates controls how much it moves in either direction. The ground beneath is not constant. It’s a vibrant, dynamic planet. Over long periods of time, it’s constantly changing. 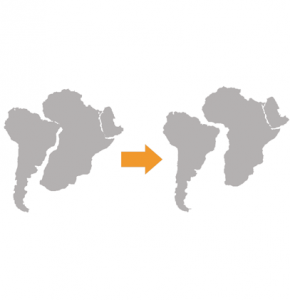 This phenomenon is continental drift. For example, earthquakes split the Earth’s crust creating mountain ranges and new land. Even geysers shoot out water when it seeps into the Earth’s cracks. 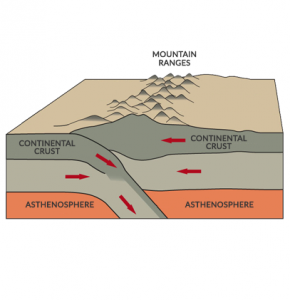 Plate tectonics drive the reshaping of continents. Inch by inch, this accounts for incredibly long distances over millions of years. Continents collide creating a supercontinent cycle. Then, they detach again into a new configuration. All the result of convergent, divergent and transform plate boundaries. Wanna learn more about our dynamic planet? All planets have layers. Inside Earth, we have a crust, core and mantle. Imagine a team of drillers who set out to drill a hole to the other side of Earth. Volcanoes are the foundation for igneous rocks. When volcanoes erupt, magma and lava spews out. After cooling and solidifying, they become igneous rocks. We can’t physically go inside the Earth. But we use seismic tomography from earthquakes to see inside our planet. From Earth tomography, we create 3D models.